• For the first time in 70 years, key Impressionist and Post-Impressionist works from the Courtauld Gallery are going on display at The National Gallery. The 26 works, which include pieces by Daumier, Manet, Renoir, Cézanne, Seurat and Bonnard, were all purchased by Samuel Courtauld in the 1920s and are being displayed alongside paintings from the National Gallery’s own collection which he helped acquire. The works are being loaned as the Courtauld Gallery closes this month for a major transformation project, dubbed Courtauld Connect. The exhibition, Courtauld Impressionists: From Manet to Cézanne, traces the development of modern French painting from the 1860s to the turn of the 20th century and reveals the vision, taste and motivation of Courtauld as he acquired the pieces. 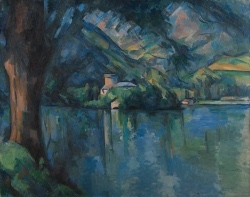 Highlights from the Courtauld Gallery’s collection include Renoir’s La Loge (Theatre Box) (1874), Cézanne’s The Card Players (about 1892–6) and Lac d’Annecy (1896 – pictured), Toulouse-Lautrec’s Jane Avril in the Entrance to the Moulin Rouge (about 1892), Manet’s A Bar at the Folies-Bergère (1882), and Seurat’s Young Woman Powdering Herself (about 1888–90). Among the works from The National Gallery’s collection being displayed alongside them are Renoir’s At the Theatre (La Première Sortie) (1876–7); as well as Seurat’s Bathers at Asnières (1884), Cézanne’s Self Portrait (about 1880–1) and Van Gogh’s A WheatKeld with Cypresses (1889) – the first paintings by the latter three artists to enter a British public collection. The display can be seen in The Wohl Galleries from next Monday until 20th January. Admission charge applies. For more, see www.nationalgallery.org.uk. PICTURE: © The Samuel Courtauld Trust, The Courtauld Gallery, London. • The British Library’s second ‘Season of Sound’ kicks off this month with a series of events celebrating the library’s vast Sound Archive. Among highlights are the pop group Saint Etienne’s only UK performance this year, a live orchestra celebration of ‘library music’ by KPM All Stars and a silent disco. The programme of events at the King’s Cross venue kicks off next Monday. Admission charges apply. For the full programme, see www.bl.uk/events/season-of-sound. • The work of internationally-renowned architect and honorary Royal Academician, Renzo Piano, goes on show at the Royal Academy in Piccadilly from Saturday. Renzo Piano: The Art of Making Buildings is the first comprehensive survey of Piano’s career to be held in London since 1989 and presents 16 of his most important projects. They include the Centre Pompidou in Paris (1971), the Jean-Marie Tjibaou Cultural Centre in Nouméa (1998), The New York Times Building in New York City (2007), The Shard in London (2012), the Jérôme Seydoux Pathé Foundation in Paris (2014) and the Whitney Museum of American Art in New York City (2015). Among events being held to mark the RA’s 250th anniversary, the display in the Gabrielle Jungles-Winkler Galleries can be seen until 20th January. Admission charge applies. For more, see www.royalacademy.org.uk.